New super-efficient rooftop units that heat and cool commercial buildings offer significant energy and dollar savings, say scientists at the Department of Energy’s Pacific Northwest National Laboratory. They found that the devices reduce energy costs an average of about 41 percent compared to units in operation today. The newly published report analyzes the operation of the commercial rooftop HVAC unit known as the Daikin Rebel, which was one of two units to meet DOE’s Rooftop Challenge, a competition for manufacturers to create a rooftop unit that significantly exceeds existing DOE manufacturing standards. Daikin Applied was the first to produce such a unit, which was studied in depth by PNNL researchers; Carrier Corp. also met the challenge. The work is part of a broader DOE program known as the DOE Rooftop Campaign, which promotes the adoption of efficient rooftop units. 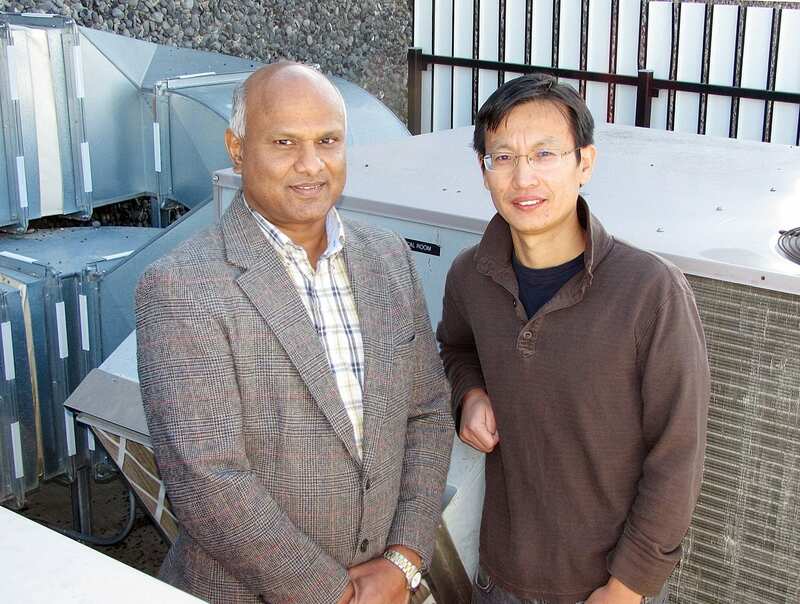 The PNNL study, done by scientists Srinivas Katipamula and Weimin Wang, is an in-depth look at the performance of the Rebel compared to other rooftop units in use today. The devices are usually nestled on building roofs, far from view but crucial to our comfort. The devices demand a significant proportion of the 18 quadrillion BTUs of energy that the nation’s commercial buildings swallow every year. The PNNL team estimates that if current rooftop units were replaced with devices similar to the Rebel over a 10-year period, the benefits in terms of energy saved and reduced pollution would be about equal to taking 700,000 cars off the road each year. Put another way, the reduced energy draw could idle about eight average-size coal-fired power plants in each of those 10 years. If all rooftop units with a cooling capacity of 10 to 20 tons were replaced immediately, DOE officials estimate the cost savings at around $1 billion annually. “There are great gains waiting to be made in energy savings, using technologies that exist today,” said Katipamula, whose study was supported by DOE’s Office of Energy Efficiency and Renewable Energy. Katipamula and Wang ran extensive simulations analyzing the Rebel’s performance compared to other rooftop units. The pair used DOE’s Energy Plus building energy simulation software and worked with detailed performance data supplied by Intertek of Cortland, N.Y., which tested the units in the laboratory. Katipamula and Wang also created several new computer models — a necessary step because they were testing technology that has never existed before. The Rebel includes variable-speed fans and a variable-speed compressor, which allow it to respond more precisely to conditions inside a building than conventional technology. The team ran simulations for a typical 75,000-square-foot big-box store in three cities: Chicago, Houston, and Los Angeles. They compared performance of the Rebel to three types of units: those in use today, those that meet current federal regulations for new units, and those that meet more stringent requirements, known as ASHRAE 90.1-2010 standards. DOE designed the Rooftop Challenge to exceed the ASHRAE standards. April 4, 2019 - Lehigh Valley nonprofit practices what it preaches, holds groundbreaking on $5.4 million net-zero energy offic Allentown Morning CallWould you want to work in a building that has no electric bills? That's the goal of the Lehigh Valley's first net-zero building. September 26, 2018 - Cooling is warming the planet, but market failures are freezing the AC industry's innovation GreenBizAnd four reasons why the business of air conditioning is slow to make strides in both cost or efficiency. March 21, 2019 - 'Coal just isn't the future': Meet the Kentucky miners picking up a new trade GristJobs in southeast Kentucky's coal mines are vanishing. What will replace them? February 26, 2019 - EESL Launches Energy Efficient Air Conditioning Program Mercom IndiaEESL has launched a “Super-Efficient Air Conditioning Program” for residential and institutional consumers in Delhi who procure power from BSES.